A photo of two flight attendants praying for their plane to take off on time has gone viral online, after recently published reports revealed the extent of China’s notorious flight delays. 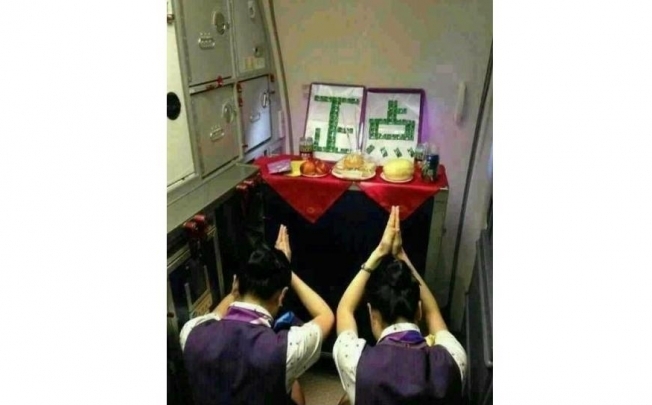 In a photo widely circulated online, two flight attendants were seen in an airplane cabin kneeling in front of a food trolley that appeared to be arranged as an makeshift altar. A poster with the words “be on time” written on it was placed on the trolley, surrounded by food and fruit. It is traditional in Chinese culture to pray for good fortune to gods or ancestors in front of altars, with food and lit incense sticks as offerings, at home or in temples. Airport and 1,126 flights were delayed by more than four hours, according to the tracker. The photo of the praying flight attendants hit a chord with Chinese internet users with many expressing sympathy. “Even flight attendants want to get off from work earlier,” one internet user commented on microblog, Sina Weibo. 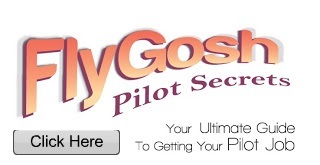 “Understandable, flight delays are truly annoying,” said another blogger. The two flight attendants in the picture appear to be wearing uniforms of Xiamen Airlines, a regional carrier partially owned by China Southern Arilines. Officials at Xiamen Airlines declined to comment on the authenticity of the picture, but said it was not a violation of company regulation for flight attendants to pray in flights, reported Haixi Morning News, a newspaper based in Xiamen. The paper also said that Xiamen flight attendants are not alone in seeking help from a higher power to improve their on-time records. 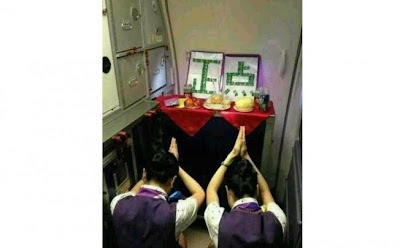 Smartly-dressed crew members from several other carriers, including China Eastern Airlines, have also been photographed in recent years bowing in front of makeshift "on-time" altars, sometimes made of juice or food boxes.